GREENSPOINT – The Houston Intercontinental Chamber held their annual Business Awards banquet last Thursday night, and the format included the Chamber’s awards categories, and this year seven businesses that were chosen by the four participating management districts. The evening started with Congresswoman Sheila Jackson Lee swearing in the new Board Chairman, Linda Mercier, and Appreciation Certificates for the Chamber and the board. This was followed by a sometimes humorous presentation of the accomplishments of the Chamber over the last year by president Reggie Gray, covering new business relationships both local and international, monthly meetings and special programs and forums, and a long list of government and business leaders that have met with the Chamber for mutual benefit. Gray also outlined future events for the Chamber in 2012 and 2013. These include a Health Care Summit in November, and an Economic Forum in January, as well as monthly cultural events with Authors, Artists, and Museums. He also forsees providing Tours and Travel planning for chamber members and joint trips. To the entertainment of the large crowd, Gray presented some of this and later awards in various foreign accents. Noble Energy was the major title sponsor of the banquet, along with 24 other companies and chamber members. Also making presentations were Don Ball of Lone Star College Small Business Development Center, Rita Leader of SCORE, and HCC on Goldman Sachs small business program. Management Districts that presented Awards to businesses in their area included Rebecca Reyna of Greater Northside Management District, Business of the year to Jose Jimenez of State Farm Insurance; Teri Koerth of Airline District to Custom Vans and UPS, with remarks by Mark Cross and Roger Brown; Richard Cantu and Gerald Overturff of East Aldine District, to Jose and Gloria Del Santiago for El Peon Restaurant, and Enrique Morales for Kroger Supermarket; and Jocklynn Keville of Greenspoint District to Darin Spears of Fibertown and Larry Bundy, Corey Briggs and Kelly Harvey of Hyatt Houston Hotel. In addition to these awards, president Reggie Gray announced Pinnacle Awards to Ms. Jess Bailey, John Ferrell, East Aldine District with Gerald Overturff and Flor Rios, Sidney Evans, and Elejandro Del Valle. The Ambassador Award went to Autumn Knight of Sysco, the Committee Award to Michelle Oshinsky of Primeway FCU, Small Business Award to Bob Beasley, Company Award to John Higgans of Neutex Energy, Corporation Award to CEVA Logistics, Business Partner Award to Sysco, John Zizelmann Humanitarian Award to Pastor Andrew Watkins, Volunteer Award to Bill Pilkington, and Citizen Award to Mariana Sanchez. In addition Gray gave Lifetime Achievement Awards to Dr. Wanda Bamberg, Dr. Jim Cain, and Dr. Ralph Draper, all school superintendents in the Chamber’s service area. HOUSTON – Senator Mario V. Gallegos, resting comfortably at Houston’s Methodist Hospital and surrounded by family members and close friends, passed away on Tuesday, October 16, following complications associated with his liver transplant performed in 2007. Gallegos was 62 years of age. The Senator’s family is enormously grateful for the outpouring of support, thoughts, and prayers expressed during the last few days. He is survived by his wife, Theresa Gallegos, daughter Ali Templer, daughter Melissa Gallegos, son Mario Elias Gallegos, five grandchildren: Jake Gallegos, Hollis Templer, Jesse Gallegos, Teresa Hernandez, and Cristina Hernandez. The Senator is also survived by his mother, Olga Gallegos, sister Maria Gallegos, sister Olga McGee, sister Lillian Villarreal, brother Joel Gallegos, brother Michael Gallegos, sister Cynthia Trevino, and a host of extended family. Senator Gallegos was pre-deceased by his father, Mario Gallegos, Sr. Details on services for the Senator are pending; they will be announced when finalized. It is the intention of the Gallegos family to hold funeral services in Houston, and a memorial service in Austin. The Senator will be buried in Houston. A lifelong Houstonian, Mario V. Gallegos, Jr., has dedicated his career to helping others. After serving 22 years in the Houston Fire Department where he retired as Senior Captain, Gallegos continued his public service in the Texas Legislature. Elected to the Texas State Senate in 1994, he is the first Hispanic Senator elected to represent Harris County. Prior to his election to the Senate, he served two terms in the Texas House of Representatives. 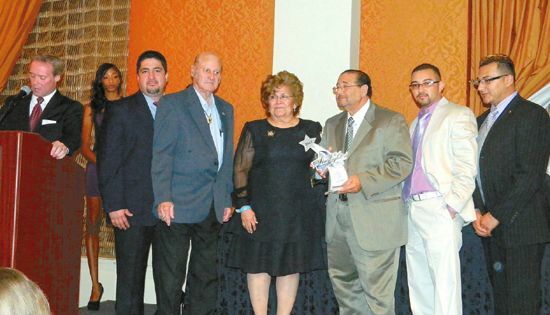 Senator Mario Gallegos has been a champion of continued growth and prosperity for the people of Senate District 6. During his decade of service both in the House and Senate, he has sponsored and passed legislation creating economic opportunities for communities that have long been passed over for development. He has passed legislation creating municipal management districts that have revitalized communities and serve as a model for other Texas cities. Known as one of fire safety and law enforcement’s “best friends”, he has received numerous awards for passage of legislation benefitting members of our firefighting and policing communities. Most recently he was recognized by the Texas State Association of Fire Fighters and the Combined Law Enforcement Association of Texas for his work during the 77th Legislative Session. Senator Gallegos is also one of the biggest champions for senior citizen and education issues. From ensuring Medicaid funds for personal needs of residents in long-term care facilities to fighting for teacher pay raises and higher education funding, he continues to serve as an influential voice in Austin for his constituents back home. A graduate of the University of Houston, he serves as one of his alma maters strongest voices in Austin. The University of Houston System continues to attract a growing number of students, and maintains its position as one of the premiere university systems in the state. Senator Gallegos continues to work toward ensuring that the current levels of university funding for the Houston area increase to meet the growing demands of Senate District 6. 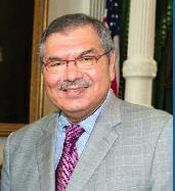 He has received numerous awards in appreciation for his work during his legislative tenure including: Texas Municipal League’s “Distinguished Legislative Service Award”, Sierra Club’s Legislative Service Award, Texas Women’s Political Caucus Good Guy Award, Legislator of the Year by the Mexican American Bar Association of Texas and the Fiestas Patrias Distinguished Hispanic of the Year Award. Senator Gallegos continues to be active in many local, state and national organizations and is constantly working with them to help further their goals. East Aldine residents have been without heavy trash pick-up service for about six months, when Harris County Pct. 2 took over much of the territory that was previously in Pct. 1. Because Pct. 2 was new to this area, they did not have any money in their budget, and therefore had to suspend this important collection service. The East Aldine District has been meeting with Pct. 2 to find a solution to this problem. Now an agreement has been reached, and in the near future the curbside pickup of heavy trash will resume, according to Richard Cantu of the District. In partnership with Pct. 2, the District will provide about 20 neighborhood pick-ups, starting in March of next year. This will actually reach 30 of the 34 neighborhoods in the East Aldine District. Pct. 2 will provide manpower and equipment as their part of the deal, and East Aldine District will pay for landfill fees and promotional costs. At their last board meeting, East Aldine District voted to pay approximately $135,000 for the landfill fees. This figure was an estimate, based on previous costs that Pct. 1 had incurred. In an exclusive interview with the Northeast News, Pct. 2 commisioner Jack Morman thanked the district for their participation, and said he will look for additional funds in the future for the County to assume more of the costs. HOUSTON (October 16, 2012) – Lone Star College-North Harris and Farouk Systems announce plans to expand their partnership and create the first CHI Lone Star College-North Harris School of Cosmetology, with an official groundbreaking event Tuesday, October 30. Expected to open in the spring of 2013, the school will be located at a newly-constructed facility adjacent to the CHI manufacturing plant in North Houston. The new school will transform one of the college’s longest-running programs into Houston’s premiere destination for cosmetology training. “Our initial agreement with Farouk Systems was the first of its kind and placed us on the leading edge of community college partnerships. With this expansion of our relationship, we can provide students with unmatched resources and unique insight in a highly-competitive and growing industry,” said Dr. Steve Head, president of LSC-North Harris. In 2010, the college partnered with Farouk Systems to provide professional development for instructors, as well as access to safer, more advanced CHI products for students, and expanded career opportunities for its graduates. “Education is the foundation for success and innovation. This partnership with Lone Star College-North Harris fulfills my dream to give young beauty industry professionals the tools to build not only a career, but a business. We hope this CHI School will be the first of many,” said Farouk Shami, founder and chairman of Farouk Systems. The new venture will capitalize on the world-renowned products and methods of Farouk Systems, along with the college expertise in education and training. Graduates will be prepared to work in the most sought-after industry positions, and have an invaluable understanding of both client service and the manufacturing process. The new school will have a strong emphasis on student career placement assistance, drawing on Farouk Systems’ large network of affiliated salons and industry contacts, and will feature a dedicated career placement advisor. Under the agreement, LSC-North Harris and Farouk Systems will also combine to provide $140,000 in scholarship funds for cosmetology students. “We expect approximately 35 students in the inaugural cosmetology class, with a total capacity for more than 100 students in the program each year.” explained Dr. Head. “In addition, we plan to offer training in related fields such as nails, lashes and massage therapy. The ground breaking for the new CHI Lone Star College-North Harris School of Cosmetology will take place at the CHI manufacturing facility located at 880 East Richey Road in Houston on Tuesday, Oct. 30 at 3 p.m. Prospective students can request additional information by calling 281.618.1169, or by visiting LoneStar.edu/CHIschool to begin the application process. Harris County voters will be able to vote early starting on Monday, October 22 through Friday, Nov. 2nd. 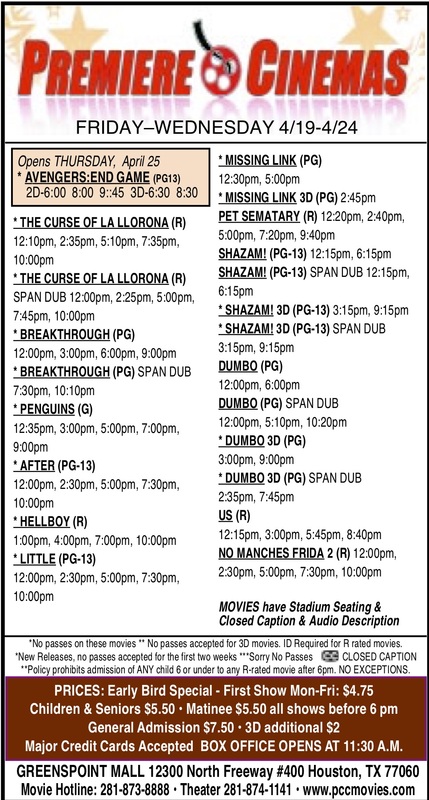 Hours are 8 am to 4:30 pm Oct. 22 to Oct. 26, 7 am to 7 pm on Saturday, Oct. 27, 1 pm to 6 pm on Sunday Oct. 28, and 7 am to 7 pm Oct. 29 through Nov. 2nd. Locations that are convenient for Northeast area voters include the Harris County Administration Building, 1001 Preston, 7002, Northeast Multi-Service Center, 9720 Spaulding Street, 77016, Hardy Senior Center, 11901 W. Hardy Road, 77076, Octavia Fields Branch Library, 1503 S. Houston Ave., Humble 77338, and Acres Homes Multi-Services Center, 6719 W. Montgomery Rd. 77091. There are a total of 37 early voting sites, and officials urge voters to take advantage of these, because the ballot this year is long and complicated, with a number of national and local candidates, and many bond issues and referendums included for some or all areas of the county. This is of course a general election, set for Tuesday, November 6th from 7 am to 7 pm. National candidates will include a U. S. President, either Democrat Barack Obama or Republican Mitt Romney. Their running mates are Joe Biden for VP, or Paul Ryan. Also running are Libertarian Gary Johnson and Green Party Jill Stein. For U. S. Senator to replace retiring Kay Bailey Hutchison, voters have a choice of Republican Ted Cruz, Democrat Paul Sadler, Libertarian John Jay Myers, or Green Party David Collins. For U. S. Representative in the 18th Texas District, the incumbent Democrat Sheila Jackson-Lee will face either Republican Sean Seibert or Libertarian Christopher Barber. In the last election in 2010 Jackson-Lee received 70% of the vote. For U. S. Representative in the 29th District, incumbent Democrat Gene Green has no Republican challenger, but faces opposition from Libertarian James Stanczak, and Green Party’s Maria Selva. In State Senate District 6, Mario Gallegos Jr. is running against Republican R. W. Bray. In State District 13, incumbent Rodney Ellis is running unopposed. In State House races, in District 139 Democrat Sylvester Turner is running against Republican Sam Brocato. In District 140, Democrat Armando Walle is running unopposed. In District 141 incumbent Democrat Senfronia Thompson is running against Republican Michael Bunch. In the last election in 2010, Thompson received 76% of the vote. In Harris County offices, in the District Attorney race has Democrat Lloyd Oliver running against Republican Mike Anderson, who upset the incumbent Pat Lykos in the primary. For County Attorney, incumbent Democrat Vince Ryan faces Republican Robert Talton. For Harris County Sheriff, incumbent Democrat Adrian Garcia faces Republican Louis Guthrie and Green Party Remington Alessi. In the race for County Tax Assessor-Collector, well known Republican politician and city councilman Mike Sullivan is running against Democrat Ann Bennett and Libertarian Jess Hopson. Harris County Commissioner for Pct. 1 has incumbent Democrat El Franco Lee facing Republican Chuck Maricle. In Pct. 4, incumbent Republican Jack Cagle is running against Democrat Sean Hammerle. Cagle was appointed by the County Commisioners last year to fill the rest of the term of Jerry Eversole, who resigned. In Pct. 1 Constable’s race, Democrat Alan Rosen faces Republican Joe Danna. Also running are Libertarian James Lancaster and Green Party Carlos Villalobos. In Pct. 3 Constable race, the incumbent Democrat Ken Jones is running against Republican challenger David Cruzan. The most interesting local race will be for positions on the North Forest School Board. For Position 4, Thaddeus Seals is running unopposed. For Position 5, the incumbent Albert Coleman is running against two opponents, Linda Bell Robinson and JoAnna Love Casey. Also on the ballot will be a METRO referendum to choose how the 1 cent sales tax is used. The City of Houston will have two Propositions regarding revisions in wording of certain laws. More importantly they will have 5 Propositions, A to E, regarding issuing of bonds to pay for public safety facilities, parks, public health, libraries, and housing. Houston ISD will have a proposition asking to authorize bonds for construction totalling $1.89 billion dollars. Houston Community College will present a bond request proposition for $425 million for new facilities. 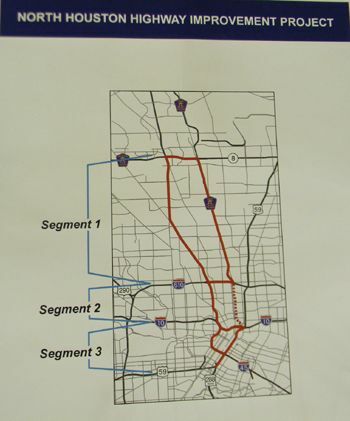 HOUSTON–Last Thursday (Oct. 11) at its second public scoping meeting at Aldine ninth grade school, the North Houston Highway Improvement Project presented some alternatives for transportation improvements in three segments of the city (see map to the right). 1. Widen Existing with elevated managed lanes: Addition of director connector from IH-45 to Hardy Toll Road that includes four (4) managed lanes. Also includes widening of Hardy Toll Road to provide one additional lane inbound and outbound. 2. Widen Existing: Twelve (12) lane section-includes eight (8) general purpose lanes and four (4) managed lanes. Additional ROW will be acquire on West side of IH 45. 3. Widen Existing: Twelve (12) lane section-includes eight (8) general purpose lanes and four (4) managed lanes. Additional ROW will be acquired on East side of IH 45. 4. Widen Existing: Twelve (12) lane section-includes eight (8) general purpose lanes and four (4) managed lanes. Additional ROW will be acquire on both sides of IH 45. 5. Elevated Managed Lanes: Twelve (12) lane section-includes eight (8) general purspose lanea and four (4) elevated managed lanes on a single structure at the center. 6. Elevated Managed Lanes: Twelve (12) lane section-includes eight (8) general purspose lanes and four (4) elevated managed lanes on two (2) separate structures on left and right sides of centerline. Last meeting purpose was to present and gather people’s input on the preliminary alternatives as well as to discuss the project and answer any questions. Raquelle R. Lewis, public information supervisor and special projects administrator with the Houston District said that criteria and alternatives must be evaluated to meet the goal. The road does not provide adequate capacity for existing and future traffic demands, resulting in congestion, longer travel times and reduced mobility. The one-way reversible HOV (High Occupancy Vehicle) lane serves traffic in only one direction during the peak hours and is unused for large periods of the day, limiting its use. IH 45 is a designated evacuation route for the region; at its present capacity, its effectiveness would be limited in case of a hurricane. Portions of the IH 45 do not meet current roadway design standards, creating a safety concern. Other deficiencies also include inadequate stormwater drainage (specially on frontage roads between Parker Road and Gulf Bank). The North Houston Highway Improvement Project involves evaluation of the highways in the three segments and identify areas of concern and implement an integrated system of transportation improvements that would manage traffic congestion in the IH 45, provide expanded transit and carpool opportunities, expand roads for emergency evacuation; in one word, a solution to all deficiencies cited above. It’s expected that by 2016 a Record of Decision should be completed. Environmental impacts will be also evaluated for the recommended alternatives that meet the purpose of the project and then a preferred alternative will be selected, including a no build alternative. This project also requires the participation of other agencies such as the Federal Highway Administration, Texas Department of Transportation (TxDOT), United States Environmental Protection Agency (EPA), City of Houston, Harris County, Harris County Toll Road Authority, Texas Parks and Wildlife Departmant among others. Your input is important in this phase of the project. HOUSTON–Construction is anticipated to begin by year end on the Spring Recreational Area, a 10-acre Greenspoint site soon to be transformed into the state’s largest skate park on one side, with a showcase facility for special needs children on the other side. Capable of hosting world-class competitions and exhibitions, the skate park will be the perfect complement to downtown’s Lee and Joe Jamail Skate Park, and just the ingredient needed to turn recreational facilities into economic opportunities. “This park will provide much needed quality of life and park infrastructure for north Houston’s large and ever-growing youth population,” said Barry Blumenthal, a downtown financial analyst. Being built by the Greenspoint Redevelopment Authority, the park’s design is already complete, paving the way for a quick start to construction. The facility is expected to have the grand opening in Spring 2014. With 72,000 square feet of skate surface, the skate park will cater to the young and young-at-heart. The unique design includes a world-class competition-scale Texas bowl featuring a full pipe, 12-foot vert ramp, 10-foot bowl, banked walls and speed hips, plus a couple of backyard-style pools and three beginner/intermediate/advanced flow bowls. A section designed to emulate the street-skating experience will have ledges, rails, benches, banks, quarter pipes and stair obstacles, providing fun and creative challenge for skaters of all levels and interests. A second aspect to the recreational complex, the park without limits, is generating excitement in the world of special needs youth. Called Dylan’s Park, after an area child who was severely injured and later died from child abuse, this section of the facility will have areas designed to engage children who are sight impaired, hearing impaired, autistic or wheelchair-bound. Dylan’s Park will also include open grassy areas for unstructured play, and the facility will be completely fenced. While a park that caters to both skaters and special needs children may seem inconsistent, Greenspoint Redevelopment Authority Executive Director Sally Bradford said there are numerous synergies. “Skateboarding has been shown to have therapeutic applications for autistic children,” Bradford noted. “And the small inclines of the beginner’s skate area are perfect for wheelchairs. We could even close off the skate park for a couple of hours a week for wheelchair games, effectively making the entire facility a park without limits,” Bradford said. The entire facility’s $5.5 million price tag also provides for walking trails and a community center. Maintenance will be handled by the Greenspoint District, which maintains other parks developed by the Greenspoint Redevelopment Authority. The District and the Authority are also working together, with other public and private sources, to create a system of trails connecting the area’s parks to Greens Bayou. “A park with no limits, a park for skaters, a park to be connected to the bayou greenway along Greens Bayou – it is precisely these types of projects that will benefit our city’s health and urge more of our kids to get outside,” said Roksan Okan-Vick, the executive director of the Houston Parks Board. “As the City aims to complete the Bayou Greenways Initiative – an initiative that will create parks and trails along all seven of the major bayous throughout the city – a project like this is a wonderful example of how smart planning works for the benefit of our community,” Okan-Vick concluded. (HOUSTON, TX) Sep. 26, 2012 — Sheriff Adrian Garcia and the Harris County Sheriff’s Office (HCSO), along with the Drug Enforcement Administration (DEA), the Coalition of Behavioral Health Services, and Houston Crackdown, announced the establishment of a permanent prescription drug drop-off location at the HCSO Aldine Storefront, located at 5202 Aldine Mail Route, at a news conference on September 26, 2012. 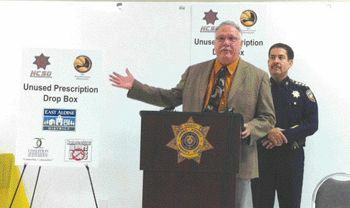 Sandy Olson, Executive Director of the Coalition of Behavioral Health Services, organized the first medication take-back in Houston at a local grocery market in February 2010. When the DEA began hosting national take-back events shortly thereafter, her Coalition along with many other organizations and law enforcement agencies in the Greater Houston area joined in to support the DEA in this groundbreaking effort. Temporary drop-off locations have been set up twice a year since 2010, but the location at the HCSO Aldine Storefront is the first permanent drop-off in Harris County. According to the 2009 National Survey on Drug Use and Health, every day about 2,500 teens use prescription drugs to get high for the first time; 16 percent of the teens who abuse pain relievers did so before the age of 15. Of those surveyed, 62 percent believe that teens got their prescription medications from the family medicine cabinet. 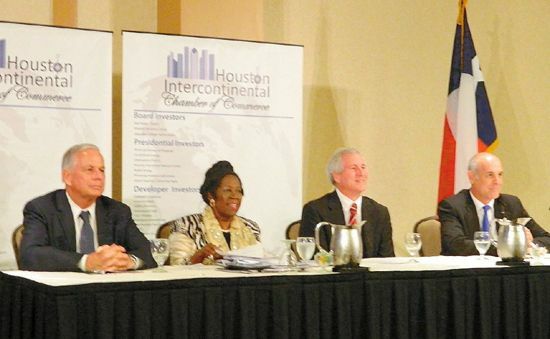 NORTHEAST – With the election only a few weeks away, candidates and incumbents met with the public and members of the Houston Intercontinental Chamber last Tuesday, Sept. 18 to present their accomplishments and their goals for a new term. Speaking were Congressman Gene Green, D. Texas 29th District Texas, Congresswoman Sheila Jackson Lee, D. Texas 18th District Texas, Candidate for 2nd District Republican Jim Dougherty, and Candidate for 18th District Democrat Sean Seibert. Also speaking were Texas State Representatives Senfronia Thompson, District 141, and Debbie Riddle, District 150. Green spoke about his roots to the area, and serving on two important commitees in Congress, Energy and Healthcare. He is running with no opposition. Jackson-Lee spoke about issues of concern to her, including housing, rail transportation, Homeland Security, disaster aid, youth programs and veterans services. Candidate Jim Dougherty, a Democrat, is running to represent District 2 in Congress, a position now held by Ted Poe. He pointed out how the district boundaries have been “gerrymandered” this year, stretching from Aldine to the East. An attorney and CPA, he said he supports Obama in most of his policies, wants to invest more in education, and realign the tax code. Candidate Sean Seibert, a Republican, is running for a seat from the 18th district against Jackson-Lee. He reviewed his career as an Army Lieutenant Colonel, serving in Afghanistan and elsewhere. He says he is a fiscal conservative, wants fiscal responsibility and debt reduction, and strong border security and national defense. State Representative Senfronia Thompson holds an important position as chair of the Local Calendar committee in the Texas Legislature. She said 90% of House bills must go through her committee, for action or approval. Some important issues are financing of public schools, human trafficking in its various manifestations, a new protective order against family violence. She said the state will have a surplus, perhaps $3-4 billion to allocate in the next session in 2013, an important opportunity.